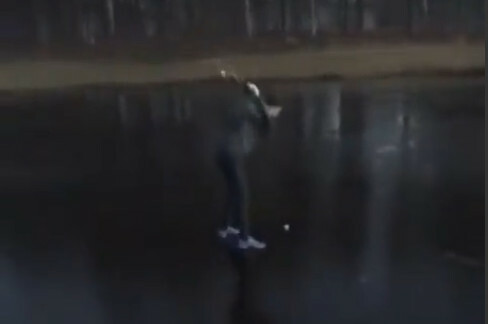 Although ice golfing is actually a thing, one recreational hacker found out the hard way that practicing on the local frozen lake might be hazardous. Watch as this poor fellow takes a cut a bit on the fat side and takes out a chunk of ice right below his feet. His friends meanwhile, would rather laugh and hold the camera then help the guy out, and for that we salute you. And because it’s the internet, this video has gone viral without even one iota of detail as to who, what, when, where, how… nothing. So anyway, enjoy the clip.